There's nowt so queer as folk... or so the saying goes. Well there's nowt so queer as folk horror. Throughout the history of horror cinema, one of the constant characters has been the British landscape and the strange people who inhabit the rural areas. Paganism, devil worship, murderous villains and all manner of monsters have inhabited bleak and foreboding landscape. Films such as 'Quatermass 2' (1957), 'Village of the Damned' (1960), 'The Witches' (1966), 'Whistle and I’ll Come to You' (1968), The Beast Must Die (1974), 'Witchfinder General' (1968), 'Blood on Satan’s Claw' (1971), 'Dog Soldiers' (2001), 'Hound of the Baskervilles' (1959), and 'The Plague of the Zombies' (1966) all provide high points for this particular brand of horror film. Each one taps into the wealth of British folklore, whether it is the changeling-like children of Midwich or the demonic hound on Dartmoor, and links that ancient collective memory to a modern audience via the cinema. But for me it has to be 'The Wicker Man' (1973) and 'A Field in England' (2013) that top the list. 'The Wicker Man' is quite simply the quintessential horror film wrapped up in a mystery. The film has some serious acting power behind it with Edward Woodward, Christopher Lee, Diane Cilento, Ingrid Pitt, and Britt Ekland turning out great performances. The soundtrack may seem rather dated, but it nonetheless works incredibly well against the visual backdrop of an isolated community engaging in ancient rites. But best of all is its plausibility. 99% of the film is set out as a “who-dun-it?” mystery as Edward Woodward's character Sargent Howie attempts to track down a missing girl while the locals try to evade his investigations. 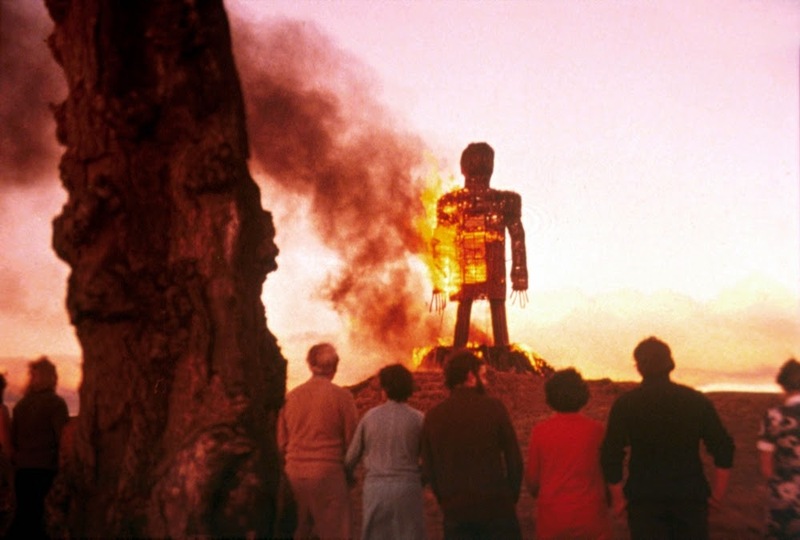 It isn't until the final moments of the film that the true horror of the situation is fully realised and the shocking image of the burning wicker man seers itself anew into the collective psyche of the nation. Ben Wheatley's 'A Field In England' on the other hand may be a fairly new film, but it perfectly distils everything great about folk horror into one gloriously psychedelic nightmare. The monochromatic cinematography, the dark ambient soundtrack, rich use of period dialogue, and the excellent acting courtesy of the small but tight cast of Julian Barratt, Peter Ferdinando, Richard Glover, Ryan Pope, Reece Shearsmith, Michael Smiley makes this a simple but effective film. The fact that it is set in open rolling countryside seemingly in the middle of nowhere and it conveys an unrelenting sense of claustrophobia as the protagonists navigate each bizarre twist in the tale. Again this isn't a straight horror tale instead it's part historical drama, part arthouse, and liberally experimental utilising subtle horror elements to underscore the occult themes of the story. Perhaps they're not everyone's cup of tea, but these films and folk horror in general hold a special place in my estimation for their often simple but brilliant stories and resonant atmospheres. Finally, in case you haven't seen it yet, we launched our second free digital compilation on 1st January 2015 to coincide with our second birthday as a website. You can download all fifteen tracks for free at out bandcamp page.